Today is a special day for me, it’s my 1 year at rfbc anniversary. Wow when I think about where I was a year ago compared to today, was that even the same person?!? I was fat and ashamed of myself. I couldn’t overachieve enough to make up for the fact that I was still obese and felt helpless about it. Then a year ago today I thought, I’m just gonna try this to see what happens, see if maybe this will work. I thought maybe I’ll lose 73 lbs and be back to my lowest adult weight, I wasn’t even thinking long term I was just thinking lose and don’t worry about the future. Little did I know I was going to heal my body, I feel fantastic all of the time, I went from a 24-size 4 but what is more I have healed my deep seated fat brain issues. I have a different view now, a different relationship with food and exercise than I have ever had in my whole life! I have gained the tools to stay thin and active and be in control at all times. I feel great because I went from always being the biggest girl in the room to now one of the very smallest. Last year my two favorite activities were naps and tv watching, now I don’t have time for either. I cycle, walk, jog, hike, climb, snow shoe and I can work physically hard, I call it working like a man:). I m also proud of my diet, I haven’t had sugar, bread or pasta, or dairy in over a year! That in itself is an amazing accomplishment. I own this new life now, this is who I am. So I’ve said it before but I must say it again. Carlene you are a miracle worker, your voice will forever be embedded in my head! Thank you for doing this program, and helping so many people!!! Thank you divas turned maintainers, you are incredible people that I am still so concerned about letting down that you keep me on the straight and narrow! !especially my twin Erica!!! You are all so wonderful, thank you thank you thank you thank you!! Wow, I don’t know that there is much more to be said about what CJane has accomplished. We are all in awe of her beauty, of her focus, determination, and all that she gives back to everyone at RFBC. If ever there was a poster child for what we stand for and who we are, it is CJane with her wonderful smile and positive attitude. CJane spoke at a conference last week with 5000 guests. This is the dress she wore. She calls it her Barbie dress. She sent me photos of her and her husband on a 30 ft TV screen. What a power couple. Would you look at her and think, wow, eight months ago she was obese? Or would you think. Man, some women are just born beautiful! Cjane has accomplished something very rare, she has not broken her program once in her 8 month journey with us. There have been some tough times, some times she wanted to scream and throw things because it felt like she should be done, so we told her: Scream. Throw things. Just don’t give up on all that you’ve done. And she didn’t. She wouldn’t. I don’t usually say anything about family when our ladies do so well, but for CJane the support her family has shown her has been a big asset to her success. Her husband has cheered her on daily. When she won the 100 lb challenge, he presented her with a tennis bracelet that he had worked for right along with her so he would have it for her on her big day. He believed in her from the beginning. Her mom gets our newsletter and watches out for her girl each month. On the day CJane hit goal, her grandmother sent her flowers. I know not everyone is lucky enough to have support like this, but for those of you who have a family member who is trying to make changes in their life, I know I can speak for CJane and say it matters. It really matters. Of course, those of us at RFBC take our share of the credit for her success as well. But, hey, supporting her was easy. Joyous, actually. In the end though, for this huge success, this beautiful woman has one person to be thankful toward. Herself. She did this. Sure we helped, her family helped, her faith helped, but she wanted this, she trusted us and believed in us, she got up each morning and walked, and she ate on plan each and every day. CJane changed for CJane! What a wonderful gift to give oneself. CJane, I guess it’s no surprise that all of us at RFBC are so proud of you and thankful that you chose to do this journey with us. You have already inspired so many as they watched your journey. You will continue to inspire many others for years to come. They may not join us at RFBC, they may not even use a raw food diet, but they will look at your before and afters and through their tears will be a spark: Hope. Belief. They will stand up and embark on their own journey, one toward health and well-being. When they struggle they will think of you, evoke the CJane within, and push forward. So on behalf of all the obese women who will stumble upon our site and your photos, thank you. Thank you for lighting a path many have given up hope of ever finding. CJaneRuns Win our 100 lbs in 7 Month’s Challenge! Have you checked out our 100 lbs in 7 Months Challenge? CJaneRun won it on Wednesday the 10th with 110 lbs gone in 7 Months. 7 Months! And as you can see in her photos she is just beautiful. You can’t tell at all that just last November she was obese! She looks just beautiful. For winning the challenge, she received a Visa card for $500. She’s sending action shots to us this weekend with the card! And she gets 4 weeks free of camp. If she loses 6 lbs in the next 4 weeks, she will receive another 4 weeks. As long as each month she loses at least 6 lbs a month or maintains her goal weight, she will receive another 4 weeks. This plan is set up to keep our winners motivated to keep losing. If they stick to the program, keep losing, once they win the 100 lb challenge, it’s simple for them to continue camp free for the rest of their weight. But nothing is free. They have to continue to lose to win! I have no doubts CJane will do that. She has 13-15 more pounds to go to goal. She has to fight the urge to return to her old ways even harder now. But she’s got all of us with her, and the support of her husband, and most importantly herself! See the rest of CJane’s Before and Afters by clicking here and going to her journey page. Check out those skinny jeans, tucked in shirt and belt. She looks amazing, don’t you agree. It’s hard to see in the photos but on her left wrist (her left) is a beautiful diamond tennis bracelet. Fifteen years ago when she got married, she told her husband that she would lose the weight and when she did, she would buy herself one as a reward. Unbeknownst to her, these past seven months, her husband had been working on getting it for her. He gave it to her on Wednesday. How wonderful is that? We are all so proud of CJane, she has now offered to help mentor other women going after the 100 lb challenge, and boy, they are reaping the rewards. Following in her footsteps, the 100 lb challengers are having amazing results. Three of our newest newbies going after the challenge, KrustyOldHag, JayaBlue and A2theSwart hit 30, 25, and 25 lbs gone this week. We’re talking in 3 and 4 weeks. Officially, it was 6 Months and 1 day. But who’s counting? And it happened last week, but we couldn’t do photos. The day before or after, I don’t remember, CJane was out hiking and tripped. She hit the ground face first and had to have stitches. She was a mess.I received a face photo while sitting next to my 4 year old granddaughter at a surgery center. She had just had her tonsils and adenoids removed. Her throat was killing her, she felt disoriented, and held tight to an ice pack on her neck. I showed her CJane’s photo of her beaten face and asked her, who did she think hurt more. She pointed to CJane’s photo. That tells you just how bad it was.We decided to hold off on the photos for a week. Now you look at them and you can barely tell she was hurt at all. She feels she healed much quicker because of how healthy she is, from all the nutritious food and walking she has done to lose 100 lbs.CJane feels she has another 20 lbs to lose, we’ll see. Look at these photos. Her body is so firm. You can’t tell she was ever obese. CJaneRun is set to win our 100 lbs in 7 Months Challenge on June 10th. To see all of her before and afters, click here to go to her Journey page. CJane does our Rawk Starz Diet with 2 Hours of Walking a Day. She did admit after the fall the thought to curl up into a ball and eat entered her mind, but she refused to do it, so she got up and walked! What can I say. CJane has been a Rawk Starz all the way through this. She will definitely win the 100 lb Challenge in June with a little less than 10 lbs to go. She has been on vacations, she has had stress, she has had her car broken into and her lunch stolen, and yet, she stays strong, perseveres, and never breaks plan. Last week she did a hike that she had attempted before coming to RFBC. It took her 4 hours and a lot of resting. This time she did it in 2 hours and was invigorated. Life changes when the fat suit is gone. Okay, she says she has 30 more pounds to go. Where it will come from, we don’t know. What we do know is her smile is contagious, her determination inspiring, and her body one of an athlete. You can’t tell that just 5.5 months ago, she was obese. These are amazing before and afters. 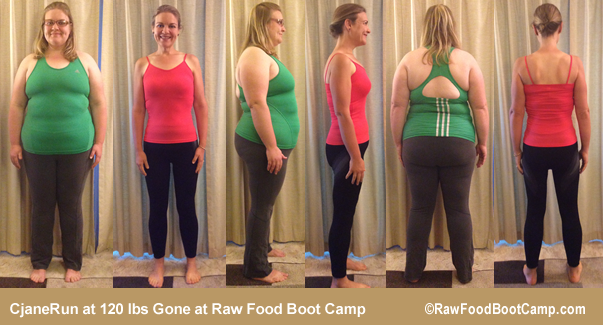 You can see CJane’s other before and afters by clicking here to go to her journey page. I told Carlene earlier when I started rfbc, I dreamed but I never thought this was actually possible. If I close my eyes and think about what I look like I picture myself as size 14/16, if someone asked what I weigh 230 pops in my mind. When negotiating space I always take the bigger gap and choose the bigger seat or take the front and let the skinnys sit 3 in the back. Yesterday I went to the thrift store to look for a couple of items, I gravitated to the x-large, but then I had to go to the large and last to the medium, I put on a medium jacket and it slid right on! I looked in the mirror, is that really me? Then I grabbed some skirts to try on, my husband said one looked a little loose, I looked at the tag, “no wonder it’s loose, it’s a 12”, I said, then gulped, was that me that said that? is this just a dream? How did this happen so fast? Being in RFBC has given me something I never anticipated, it has shown me that I CAN lose weight. I CAN get to my goal weight. The sky is the limit!! CJane Hits 80 lbs Gone in 4.5 Months! CJane is one of our top Rawk Starz Divas. She came to camp with a plan, stuck to her plan, and watched the weight fall off! Until last week. Last week, CJane hit what we call a sticky point. Her first. They are tough when you’ve been watching the pounds slip away daily. All of a sudden when the scale stops moving you’re devastated. Of course, I see this all the time. It had happened to Kace and Erica two weeks before, but no one wants it to happen to them. I told her, trust the process. We all hit sticky points, they end, and your weight loss catches up to where it would have been without the sticky point, and most importantly, I always get to say: I told you so! Thursday morning, even though not a weigh in day, CJane weighed herself and gave me my due! I told her so!! The stick is over and she has lost 80 lbs in 4.5 months! Imagine that. Of course she isn’t the first, you’ve watched Michelle and Free do the same thing this past year, but it is always exciting! And check her out. Wow! What a transformation. She told me that her husband walked around with the ipad staring at her new before and afters saying, wow, wow! No wonder. We all said wow. She doesn’t just look thinner, she looks fit. She looks awesome. You’ve got to agree! You can see CJane’s other before and afters by clicking here to go to her journey page. Cjane told me she has never weighed this little in her adult life. That seems to be a theme going on at camp. Our ladies are evolving, they are turning the tide on their life long obesity and taking charge. Look at CJane, she’s beautiful. She’s vibrant. And she did this by eating raw food and walking. Her awesome attitude hasn’t hurt either! In 20 lbs she will win the 100 lbs in 7 Months Challenge and probably be at her goal weight. Then we are going to take this diva and transition her into thin for life. Healthy for life. Her mom’s going to be real proud! Just like all of us at RFBC. CJane not only inspires everyone with her great success, she is a power of support and encouragement for everyone. We are so lucky she found us! CJane does our Rawk Starz Diet with 2 Hours of Walking Daily. CJaneRun is a 50 lbs in 10 weeks winner. A 100 lb Challenger. Mentor to Kace and overall huge RFBC Success. Right now she isn’t home and can’t weigh in, but we’re all pretty sure she’s surpassed the 62 lbs gone mark this week to earn another 4 free weeks of camp. It’s funny how quickly our ladies become embedded at camp. Three months, that’s it, and yet, CJane is one of our top Divas at camp who everyone looks up to. Not to mention, she’s super nice! She hasn’t flinched since joining camp. Rawk solid all the way. And man does it show. Big time congrats, CJane and what a pleasure it is to have you at camp. Oh, and a shout out to CJane’s mom who signed up for our newsletter to see what her girl had gotten herself into. I’m sure you’re very proud! CJaneRun is one of our 100 lb Challengers. Oh, and she won the 50 lb challenge in 10 weeks not 12! CJaneRun was skeptical when she started camp. She tried to convince herself this wouldn’t work for her. Boy was she wrong! Not only does it work, but she is loving it. She and Erica head up our Diva 2 Challenge group. Already in just 10 short weeks she is seen as a mentor to others. Not to mention a complete inspiration. She earned the 4 free weeks of camp with the ability to earn 4 more and the $50 coupon code. But that’s not the real reward, the real reward is what you see below. Oh, and her husband picked her up the other day. How fun is that! What can I say, CJaneRun is such a Rawk Starz Diva. And now she is going to join the 100 lb Challenge. I have no doubts she’ll make it. Her attitude is spot on. I mean look at that grin in her after photo. That is a woman holding a smug secret. What is that? It’s that she’s going to be skinny and even more beautiful come summer. 2015 is so the year of CJaneRun. We are all so proud of her and love having her positive, stick with it attitude here at camp. I was nervous about this program in the beginning because I was always a low carb girl. When you do low carb, fruit is as bad as cake, it’s the devil, lol! So in the last ten years I rarely ate fruit. Then when I joined rfbc, I kept thinking, how can this work?? To tell you the truth, I don’t care how it works anymore, it just does, amazingly! Changes in mindset- I think I have always blamed someone else for my weight issues, or at least blamed something else, like moving was hard and depressing, my mom, my husband put too much pressure on me……..
Now though I can see it is only me that makes me fat or thin. No one opens my mouth and inserts food but me! I feel enabled to control myself, not just let fat happen, but to be in control. this is a huge breakthrough because so often I would feel I need a reward, or just this once(5xs a week) I can splurge. Now I feel like I am rewarding myself by not eating because I am looking and feeling better. Breakthrough 2- I was tasting life and not really living life. Social events were eat feats, vacations were culinary experiences. Since RFBC what I can eat is less important than what I can do! Lately I’ve been LIVING- going to do things, not going to eat things. Turns out a lot of my friends would rather go bowling than go to a restaurant anyway and we have so much fun being active. Breakthrough 3-friends not food. I think I posted this proverb before-“better is a dish of vegetables where there is love than a fattened bull where there is hatred. It’s the people that make life good, and as long as I focus on the people, what we eat or don’t eat doesn’t matter! What matters is feeling good, enjoying life, I want to be like the ladies here, walking marathons at 63, and doing obstacle challenge races! I am so truly grateful for this group, and I feel like a completely different person than I was less than two months ago. CJaneRun is one of our up and coming Rawk Starz Divas. She drop these first 25 lbs in 4 weeks, 2 days and is on her way to officially making it into our 100 lb Challenge and winning our 50 lb challenge. CJaneRun came to camp and at first was a little discouraged with how fast the weight was dropping, but now that she has done what so many hope to do, she is feeling pretty good about things. Although one of our newest members, she is a strong voice at camp and works closely with our other new Rawk Starz Divas so they all stay on track and reach their goals.